Horror film fans have an explanation for the current situation in America – they’ve voted Donald Trump as the celebrity most likely to be suffering from demonic possession. A new survey has revealed 22% of respondents thought the controversial American politician was the celebrity probably most in need of an exorcist. This was three times higher than Trump’s closest rival Kanye West (6%), and five times higher than the third-placed Lady Gaga (4%). The fun new survey was commissioned to celebrate the launch of new television horror The Exorcist, which tells a new chapter of the acclaimed horror franchise set in modern times. Coincidentally, the survey also found The Exorcist be the highest rated horror film of all time (24%), ahead of The Shining (8.5%), Silence of the Lambs (7%), The Blair Witch Project (6.5%) and The Birds (6%). Horror fans ought to be careful, however. The survey also revealed that 26% of respondents felt a paranormal presence after watching horror television shows or films. That’s certainly something to be wary of ahead of tomorrow’s premiere! But that’s nothing compared to the staggering 13% who claim to either have been a victim of a demonic possession or know someone who has. Come on guys, we know who really ate the last jam doughnut in the office (spoiler: it wasn’t Beelzebub). 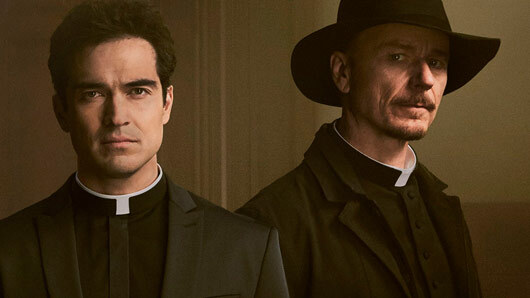 The Exorcist tells the story of two very different priests investigating the case of the Rances, a local family exhibiting the signs of a horrifying demonic possession. It stars Academy Award-winner Geena Davis, plus Alan Ruck and Ben Daniels. The Exorcist airs on SyFy (Sky channel 114 and Virgin Media channel 135) from Wednesday 19th October 2016. « The best bits from last night’s Made In Chelsea: which friendship is over and which couple are getting back together?